"A laid-back coastal town, with gorgeous sandy beaches, azure waters and a hot summer climate, it is host to among other things, Europe’s third-best beach, the stunning Fig Tree Bay." 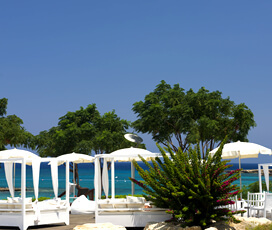 Protaras is a relaxed, family-friendly resort town in the east of Cyprus. 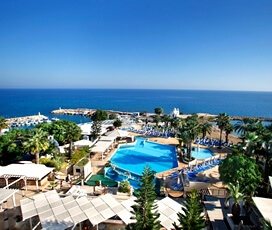 It is renowned for its beautiful unspoilt beaches, which include Fig Tree Bay, rated as Europe’s third-best beach in 2011. It is also situated close to Cape Greco a large national park, that is covered in pine trees and is a great place to hike and explore, amongst beautiful natural scenery. 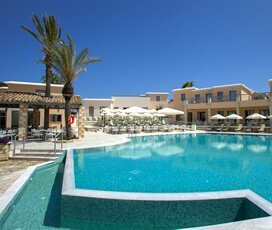 It has a large number of good restaurants that provide both local and international cuisine and is just 12.2 km from Ayia Napa, a more young, hip and trendy holiday resort, allowing visitors to Protaras to enjoy the best of both worlds. 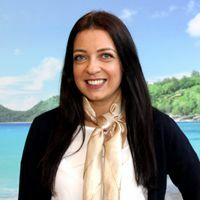 However, it is mother nature, which makes Protaras the ideal beach holiday location, from the treasures located beneath the sea’s surface, to the gorgeous beaches, craggy cliffs, dense forests. Overlooking the resort is the elegant Ayios Elias church, beautifully lit up at night, providing a romantic holiday setting, and the surrounding countryside is scattered with windmills which are used to keep the land fertile for potato growing. Single parents* - Free accommodation on AI for children. *Parent pays single. Single parents* - Free accommodation on terms booked for children. *Parent pays single. Protaras is a coastal town in eastern Cyprus and is famous for its pristine sandy beaches, foremost of which is Fig Tree Bay, which contains a lone Fig Tree and was rated Europe’s third-best beach in 2011. It provides access to the Cape Greco National Park, making it ideal for people who love to hike and explore nature. 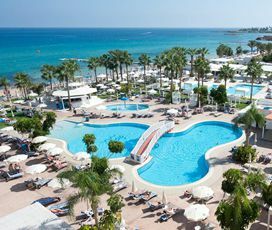 In addition, the coastal resort of Ayia Napa is just 12.2 km away from it, ensuring that there is plenty for everyone to do. 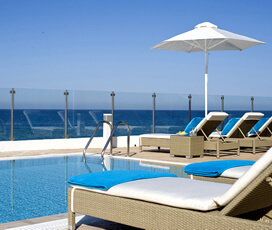 The closest airport to Protaras is Larnaca International Airport, which is about 71 km away. 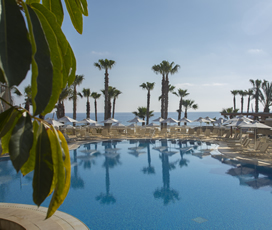 Due to its far-eastern location, Protaras may not be the best base to explore the entire of Cyprus from, though it is an excellent choice for anyone who wants to access East. The resort of Protaras was a small, quiet and picturesque area for much of its history, famous for the hundreds of windmills, which once stood where the modern town stands today. This lack of human influence only serves to enhance the natural beauty of the place, with the famous Cape Greco forest, and the beautiful horseshoe bay, the most predominant features of the beautiful natural landscape. Its cuisine features a range of different delicious dishes, using the freshest of local ingredients. Its laid-back nature makes it ideal for people who love to sit and relax in tavernas, drinking ouzo and picking at mezes, or sampling a main dish, such as a succulent kebab or barbecued fish. It is also a great place to try local Cypriot wine, which has been considered some of the finest the Mediterranean has to offer since ancient times. Protaras and nearby Ayia Napa, also offer plenty of unique takes on international food, bringing a Cypriot twist to things like Italian and Asian cuisine. 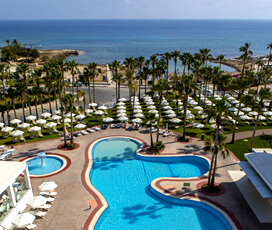 Protaras and Ayia Napa (12.2 km away) provide a wide selection of family-friendly activities, ensuring that both children and adults have a great stay in Cyprus during their family holiday. A must-see is the Protaras Aquarium, which has more than 1,000 types of marine life, offering an educational and exciting day out. 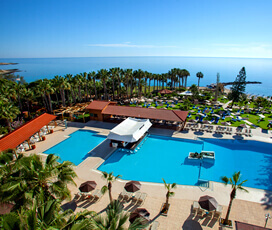 Venture a short driving distance to WaterWorld, a waterpark located at one of Ayia Napa’s beaches, that offers aquatic fun for people of all ages and The Moonshine Ranch close to Cape Greco, which offers horse and pony riding for people of all ages. 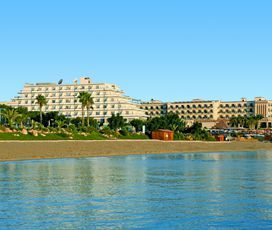 When in Protaras visit Fig Tree Bay, which was voted Europe’s third-best beach in 2011, and comes with golden sands, sapphire blue waters and plenty of fun watersports. It is also an excellent place for nature lovers thanks to its proximity to Cape Greco National Forest, which covers 385 hectares of land and is home to an array of wildlife and plant life. There is also a large aquarium for people who are interested in marine life, along with the church of Profitis Elias, which offers beautiful views of the surrounding area. 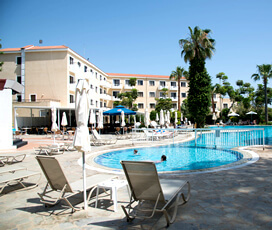 Protaras is a great destination for couples and families, offering plenty of interesting activities. With its vibrant and varied nightlife, the resort provides something for everyone, from chilled-out local restaurants, where families and friends can enjoy a meal together, to exhilarating bars playing the latest hits. 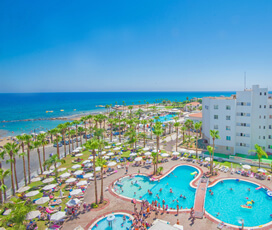 It is also just 12.2 km to the resort of Ayia Napa, which is famous for its vast range of nightlife, making it ideal for anyone who wants to have an enjoyable holiday.